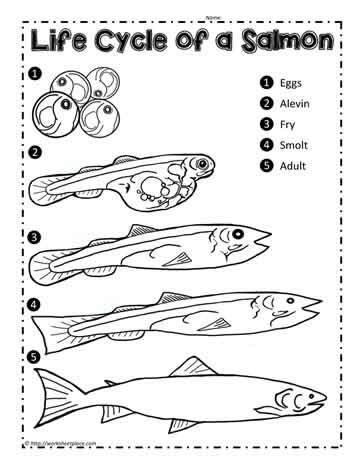 Salmon life cycle worksheets. The migration of the salmon is very unique. A salmon adult will leave the ocean, swim thousands of miles upstream to spawn (lay eggs). The egg stays in the gravel and becomes an alevin, then a fry, then a smolt which gets ready to return to the ocean and become a full grown adult salmon. The salmon will remain in the ocean until it's time to spawn and it will return to the freshwater lakes and rivers.